This past weekend Derek and I were busy out and about on Minneapolis and Stillwater! I feel like our weekend truly started on Thursday when we met up with another couple for dinner and drinks at The Union! We enjoyed a lovely evening on The Union's awesome roof top overlooking the beautiful Minneapolis skyline! Friday I headed to Stillwater so we could enjoy the lovely weather on Derek's friends boat! We enjoyed a relaxing evening chatting, drinking wine and enjoying the scenery! Saturday I hit up the Minneapolis Farmers Market with Nikki, Katie, Bridge and the babies! The Minneapolis Farmers Market is a nice 10 minute walk from my apartment which is convenient - no need to try and find parking! I was extremely impressed with the farmers market on Saturday! The farmers market was absolutely huge with rows upon rows of gorgeous produce, delicious baked goods and beautiful flowers! I picked up a ton of fresh produce including some wonderful strawberries, blueberries and the best tasting cherry tomatoes! Once we were done wandering around we headed back to myplace to meet up with Derek for lunch! We all hit up Lunds and enjoyed lunch out on the Lund's patio! 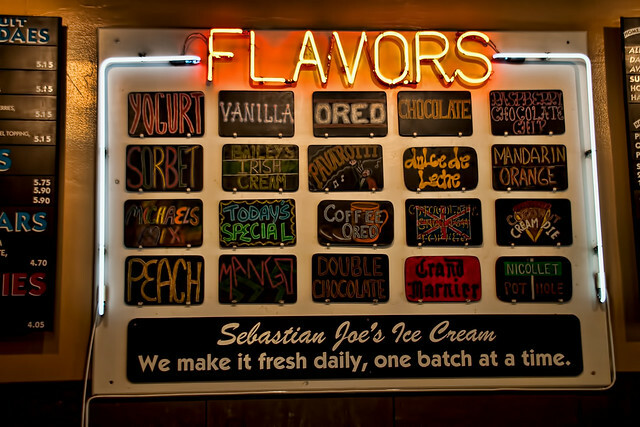 Of course lunch wouldn't have been complete without a little Sebastian Joe's Ice Cream - the cookies and cream was the best I have had! Once we said goodbye to the ladies and the babies Derek and I decided to rent a few Nice Ride bikes (read about them here) and tool around Minneapolis! We ended up going for a 9.5 mile bike ride around the city before it was time to get ready to attend the 15th Annual Jazz Fest in St. Paul with Derek's cousin Nate! Jazz Fest is one of the largest jazz events in the Twin Cities and is a free event for anyone to attend! The event took place in Mears Park which is tucked away in downton St. Paul! The event was packed with people enjoying the music and beautiful weather! It was great to be outside enjoying music, experiencing something different and enjoying the company of good friends! Our weekend wrapped up with church, a lazy afternoon by the pool, a short and sweet run, grilling and a movie! Wow! Quite a busy weekend!! Sounds like you had a blast!! Can't wait to see you in about a week!!!! Can't wait to see you either! Next week will be here before we know it! Have a wonderful 4h of July! !